Spitting Off Tall Buildings are four words about five people, which when you put them all together, they make one – one band. One of them. The other bands might be Hüsker Dü, Pixies, Black Flag, Fugazi, Mclusky, or Sonic Youth for that matter. And this influence can sometimes be heard in their music – either it´s noise, punk, melody, pop, dynamics, intensity or just a whole lotta fun. Still it´s not punk, emo or pop, but somehow all of it put together. But then again none of it at all. “When we started out, we wanted to generate the greatest amount of energy and thought it could best be done by hammering out the sound at full speed non-stop. But we forgot this type of thing usually gets on people´s nerves after 15-20 minutes. And ours too. 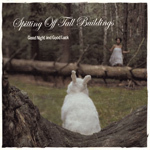 Then we discovered that loud parts come across better following a quiet part”, explains guitarist and part-time singer Paule, and this particularly characterized their debut album “Spitting Off Tall Buildings”, released in 2005 on SANCTUARY Records. The time prior to Jana´s, Paule´s, Greg´s, Andre´s and Niels´ first album was spent, like most bands, playing concerts, concerts and more concerts. It didn´t matter where or for how many people – the main thing was to keep the band on the road. Each gig was one better than the last and it brought the band ahead. Hanging around just isn´t their thing. “I think it´s the healthiest for the type of music we do – just to play, to rock all the youth centres who wanted us, in order to grow as a band and to get better at playing live. After all, we want to keep doing this for a few more years”, says Andre summing it up. The first six-song CD-EP followed the first demos. Next they went into the studio with Moses Schneider (Beatsteaks, Tocotronic) and Gordon Raphael (The Strokes). “15 songs in seven to eight days (that is, each, for instruments and vocals – not everything in eight days!!) – but it didn´t take as long as with most bands”, reports singer Jana, a renowned German actress, well known for acting in blockbusters like the award-winning movie “Alaska.de” among others, about their time together with the two. “I sang ´Questions & Answers´ in only one take. Moses and Gorden said, ´That was great!! !´ I wasn´t so sure at first, because the recording started out a bit wrong, but then that´s what makes it all the more appealing. It doesn´t have to be perfect, but it has to sound energetic.” In February 2007 the band hopped on a plane to Chicago to record their sophomore album “Good Night And Good Luck” with the master himself, STEVE ALBINI. Just one week of recording, mixing and mastering again shows their straight-forward attitude. And what we mean with this you can easily find out while listening to the lyrics of the album. The underlaying content shows, contrary to the sound, that the birth of the album was accompanied by an all-consuming catharsis to get rid of feelings polluting the songwriter´s minds. The relationship between Jana and Paul, which was somewhat responsible for getting the band started, broke up during the hard life on the road. “Good Night And Good Luck” is both their way to deal with the pain left over from this hard experience. But on the other hand: isn´t this kinda content what usually gives us the most honest songs and heart-warming listening experience in general? Two years later the band called it quits fully. So, that second album remains their swansong.